essential qualifications can apply for these vacancies using MPPEB official website @vyapam.nic.in. 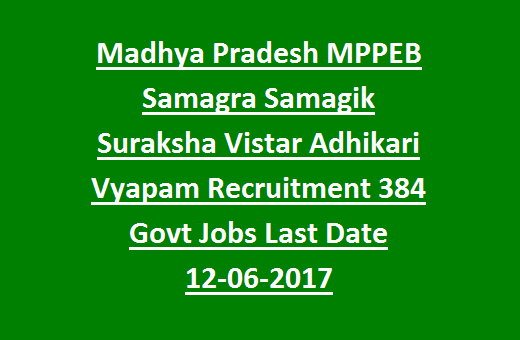 Click here to see the official Notification of MPPEB SSSVA Jobs Recruitment 2017. 2 Parts will be conducted for 200 Marks. of marks and also having good knowledge in Hindi/English. state candidates is 40 years. apply for the current recruitment through official website of MPPEB @ vyapam.nic.in. applications through online is on or before 12-06-2017. Online application process starts from: 29-05-2017. Online Applications Closed on: 12-06-2017. MPPEB Written exam Date: 01/02-July-2017. Apply online for the Madhya Pradesh SSSVA Jobs Recruitment 2017.